Yosemite, California, is a beloved vacation destination for many reasons. An area overflowing with breathtaking beauty, this stunning area features all kinds of fantastic things to do, regardless of the time of year. Hiking, biking, and swimming are just a few examples of things to do in Yosemite National Park in the summer, while skiing, snowboarding, and snowshoeing are just a preview of things to do here in the winter. Another beloved activity that countless people enjoy during this time of year in California is Yosemite snow tubing! This thrilling sport is the perfect choice for a fantastic winter day in the great outdoors of Yosemite. Learn everything you need to know about Yosemite snow tubing and add this activity to your vacation itinerary today. The Yosemite Ski and Snowboard Area (formerly known as the Badger Pass Yosemite) is the ideal place for Yosemite snow tubing. You can purchase passes that provide you with tubes and a two-hour snow tubing session down these fantastic slopes. There are about ten runs here where you can try snow tubing, and they aren’t too steep so visitors of all ages can take on these slopes easily. You’ll be treated to incredible scenery when you go snow tubing at the Yosemite Ski and Snowboard Area! This amazing feature of Yosemite National Park has spots for picnicking as well as food and drink available for purchase. Parking is free, and restrooms and lockers are available to guests here as well. Be sure to dress appropriately for the Yosemite weather! This means plenty of layers, as mornings are cold while afternoons tend to warm up quite a bit. Don’t forget goggles and sunscreen; the sun reflecting on the snow can produce a bright and almost blinding glare! The Yosemite Ski and Snowboard Area offers unlimited opportunities for fun in the snow! If you’re looking for more fun activities to try, skiing, snowshoeing, and cross-country skiing. There are additional snow play areas around Yosemite National Park for you to explore during your winter getaway as well. Come Stay with Us in the Hotel Charlotte this Winter! 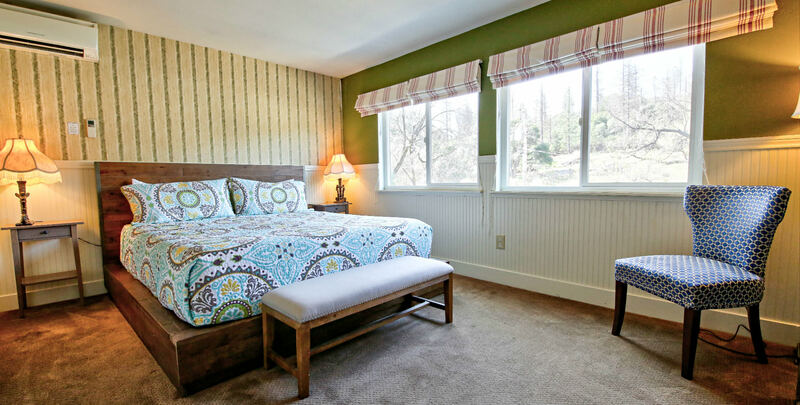 Enjoy your winter getaway to Yosemite to the fullest by staying in the most comfortable and warm accommodations! Hotel Charlotte is a historic bed and breakfast in Groveland, California, that offers luxurious lodging, creating the perfect setting for a holiday escape. Choose from staying in one of our twelve lovely rooms or renting one of our cozy apartment rentals. You can explore the many attractions of our surrounding town of Groveland, adventure through the magnificent Yosemite National Park, or simply spend time in our peaceful environment; we have an beautiful living room, friendly and helpful staff, and even our very own restaurant to accommodate all of your needs! Don’t wait another minute to start planning your dream vacation; check our availability and book your stay today! To learn more about the many things to do in Yosemite, like more activities similar to Yosemite snow tubing, download our free Vacation Guide!